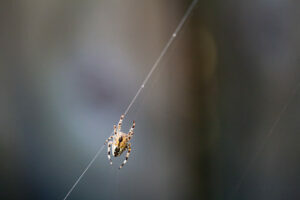 A single thread can take the spider to the prey, but a web can catch more food and keep it safe until needed. What could this possibly have to do with A Novel Approach to writing? The answer lies in whether you (the author) want to take a chance on a single high-risk prey or, instead, build up a buffet of different choices for a feast. I refer, of course, to the decision whether to write in the first person or to write, instead, in the omniscient voice. Writing fiction in the first person is an attractive prospect, particularly to novelists who are writing a first or third or tenth book. It is an intimate form that brings the reader into the narrator’s life and can make the reader see the pleasures and sorrows of the story as the narrator sees them. It lends itself to story-telling, particularly for murder mysteries and epic adventures in which Our Hero is on a quest to find the real killer, to find the girl, to vanquish a foe, or to get justice a la David Coperfield. It also lends itself to a voice known as ‘fly-on-the-wall.’ Dr. Watson’s astonished observations of Sherlock Holmes are generally first person fly-on-the-wall tales. In short, the first person point of view has the capacity to be effective. And now for the advice: Don’t do it. Resist the invitation. “I am the Vampire Lestat. I’m immortal….. I’m six feet tall, which was fairly impressive in the 1780’s when I was a young mortal man. It’s not bad now. I have thick blond hair, not quite shoulder length, and rather curly, which appears white under fluorescent light.” From The Vampire Lestat, Anne Rice. “In this he and Miriam were very different. … Nothing could be done about it now. He was forced to use his chloroform. … He was not as quick as Miriam; he needed chloroform to subdue his victims.” From The Hunger, by Whitley Strieber. In the first twenty pages of The Hunger we learn that John is dying, a surprise to me but something that all made-vampires must face. When he and Miriam enter the Wagner home, she dines in silence on the sleeping Mr. Wagner but John, who has lost his stealth, must anesthetize the dog before consuming Mrs. Wagner, a sad prelude to the future for these two night creatures. Of these three vampires, one is a self-absorbed bore; it is difficult to care what becomes of Lestat. The other two, a dying almost-vampire who must resort to chloroforming the dog, and his lovely soon-to-be widow, a tragic couple married no more than a few hundred years, are intriguing. We want to know if some cure for John’s mortality might keep the love story going. While there are surely better comparisons in the literature, these two novels demonstrate the risks of writing fiction in the first person. From the moment a novel begins with a first person pronoun, the narrator is on a straight-line trajectory with no detours to developing back stories or complex conflicts. Not only is the story his and only his to tell, but every character is confined to his perceptions, every scene is defined by his description, each event is limited to what he rationally could have seen or known, and every coincidence in the plot conflict must be explained by information the narrator did not have. If any one of those loses the reader’s attention, the novel is broken. Authors almost certainly are the worst judges of what a reader will think of a character whose essence is written in the first person; if that character is not interesting or believable or lacks something that makes the reader care about him from the outset, the author need not have written beyond page 20. First person narrators who are bores don’t last that long. The spider’s single thread can be broken at any point along the story arc, from the introduction through to meeting additional characters, in new scenes or in new conflicts. If at any time the reader’s attachment to them is lost the novel is lost. The book will be put down (or, worse, a review will be written). The spider web of omniscience has a much greater capacity to hold the reader. Each character is given not only the gifts of speech and appearance but also the gift of private thoughts — evil, wise, stupid, mean, anything and everything. The author can say what Miriam is thinking about John’s impending demise quite independently of what John thinks of Miriam. Developements, such as new blood plasma that might make John live as a dead man forever, can unfold detached from John and Miriam knowing about them during their quest for fast food humans. The reader may see what the characters do not. The web weaves every plot, character, and conflict into a layered story that comes together rather than merely coming out. Perhaps no better example of omniscient fiction exists than The Lord of the Rings. If Tolkein had confined us to Frodo’s voice, Gandalph would be limited to a few scenes in The Shire and disappearing in the Mines of Mordor, Aragorn would never fall in love with Arwen, and Gollum would be a salamander. Why? Because, as written, none of the characters and their histories happen in the company of all the members of the quest, or at the same time, much less exclusively in Frodo’s presence. Are there any well-written first person novels? Of course. There is no single way to write a novel, and exclusion of “I” as the narrator would foreclose not only Dickens’ sixth novel but Marcel Proust, William Boyd, and Ernest Hemingway, among many others. 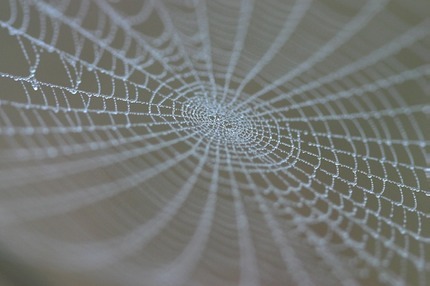 The moral of the spider web is not that one shouldn’t try to catch an audience with a single strand but, rather, that one should do so only after having first learned how to weave an entire web. It is an art that appears to be quite simple but is represented more by its gallery of failures than its successes. New novelists should learn to write in the omniscient voice. A shortcoming on that score will be apparent in the novel, even if one succeeds in completing it in the first person. If you can get past the grammar of this opening line, you are a kindler, gentler reader than I. Of course, so are literally millions of others, who made Fifty Shades of Grey a bestseller. One can only imagine the success of such a book if it had been written in grammatical English, and from an omniscient point of view. So, enough. Off to your thousand words for the day. I’ve written mine. ← A Novel Approach: Number 22 In Subordination….